Clara’s Pizza King is a fabulous Pizza King. It has good food. I recommend getting the bread sticks. Their bread sticks are thin and cooked to perfection. I also recommend getting a pizza with sausage on it. If you don’t like sausage, then you’ll like it there because their sausage actually tastes more like hamburger than sausage. The largest pizza they have is 24 inches. I recommend getting a 16 in. that can feed at most 5 people. Their pizza has a thin crust and is cooked to a crisp. 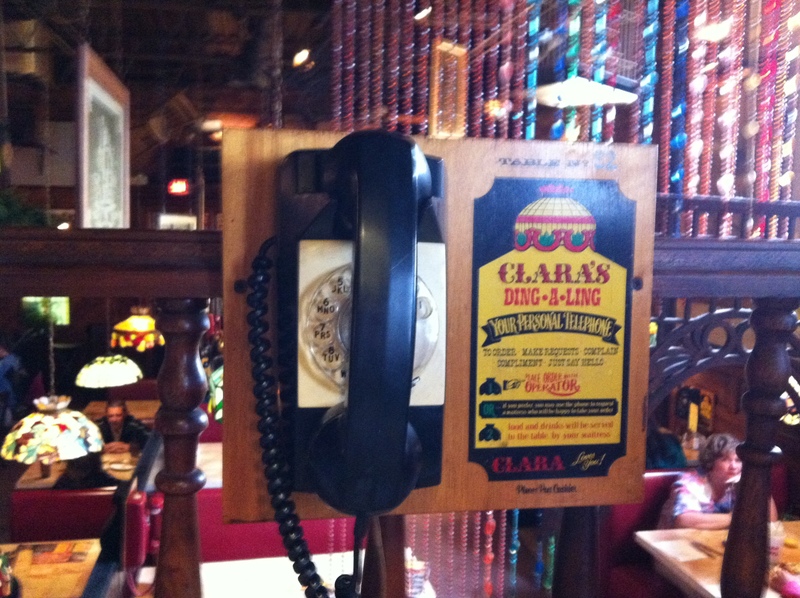 To get your food you call on an old payphone. You then tell them your seat number and order what you want to eat and drink. You order your drinks as one and they bring you a pitcher full of soda. The thing that is special about Clara’s Pizza King is that it has a real double-decker bus in it. You can only sit in the bottom part of the bus. You can call for reservations for the bus. It is a two-story tall building and has a very large parking lot. It is a great place to have a birthday party for younger kids and has a nice atmosphere. Clara’s Pizza King is not like all the other Pizza Kings. The unusul part is Clara’s in Richmond, Indiana, has a double decker bus inside. The way they got in there is they poured the cement, then pulled the bus in, and built around it. But, the food is the same. They have pizza and breadsticks. They have all the usual pizza toppings. The sausage is like hamburger. The crust is a mix of thick and thin. The tomato sauce is not runny. The pieces are cut into squares. The breadsticks have a buttery sauce on top of them. They are skinny and tasty. The Pizza King has three stories: a basment, a main story, and a top level. If I were you, I would go. Make sure when you go the bus is not reserved. The food is not really expensive, but still cost some money – compared to other pizza places. Clara’s Pizza King is good. They have the best pizza. I like olives on it. One olive was even whole! The sausage is chopped up like hamburger. It has good mushrooms too. The breadsticks are very good. They are skinny and just the right size. Inside there is a double decker bus. You could eat inside it, but it was reserved for a party. We sat on the top level. There are three levels in the restuaurant. I like the decorations because they were hanging from the ceiling – like party beads. People should go there because you would like it.